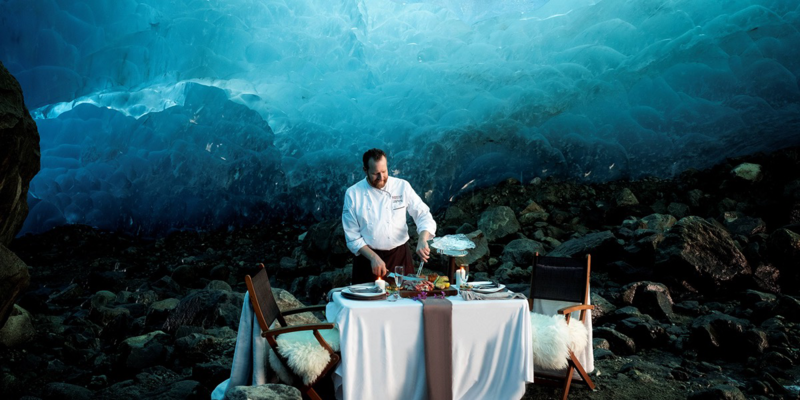 The Blue Room takes diners on an extraordinary alpine journey, where they will be led by Head-Line Mountain Holidays’ wilderness experience experts through an age-old ice cave to the setting of their private Four Seasons dinner under the aqua roof of ice. Nestled under a floor of frozen water lies the secret ice cave setting for this unique, private dining experience. Sitting below the cathedral like cave of blue, Four Seasons Executive Sous Chef, David Baarschers, will enchant guests with his culinary craftsmanship while they bask in the beauty of the elaborate grand hall of ice. Guests will be transported to the secluded location by a Mercedes limousine transfer from Four Seasons Resort and Residences and by a private helicopter journey with Head-Line Mountain Holidays. During the scenic flight toCanada’s largest, southernmost ice field to explore an evolving landscape of ice, guests will take in the surrounding alpine region from above as they soar between rocky and ancient volcanic peaks, and over towering ancient old growth forests. What: Private Mercedes transfer and scenic helicopter journey through Whistler’s mountain region. Private Head-Line Mountain Holidays escorted experience exploring natural ice sculptures, ice flows and chambers. Private 3-course dining experience with Four Season Whistler’s Executive Sous Chef, David Baarschers and silver-service waiters. Meal accompanied with Krug Champagne. For more information, please call Head-Line Mountain Holidays at 604-902-6415 or visit headlinemountainholidays.com.